Even though it's indeed a complete script, I still decided to call its 1st version a testing version, as it's the 1st time I write such a massive script(8500+ lines) with such a huge user settings region(2400+ lines), and the user scripting proficiency demand is so high that I want to know how can I make it more user-friendly by listening to user feedbacks. Back on last year's September, I've begun to think of rewriting the CATB system entirely. I thought "Maybe the rewrite should bundle everything into a single package, as right now the CATB isn't in this way and some users may prefer the former." As I began working on it, I realized my desired style's quite different from Yami's. For instance, I prefer methods with no more than 10 lines(although a few of mines still breached this limit), while Yami clearly doesn't mind the long methods(up to 60+ lines afaik). The style difference led to more and more redesign and refactoring, to the point that this script might seem to be completely different from CATB, even though this script's core skeleton's still quite similar to CATB's. I learned a lot during this 7 months(although the actual time I've put is about 7 full weeks), and I want to know how much I've improved. So I used this script as a test. I want to give users as many control and freedom as possible while still keeping this script as user-friendly as possible. That's an extremely tough balance for me to work with and right now I'm not satisfied with this yet. So I want to listen to user feedbacks to see how can I get a better balance. Finally, I want to emphasize that Yami deserves all the credits, and I'm still going to support CATB as some users may prefer the CATB's easy-to-use and modular addons style. Open the script editor and put this script into an open slot between Yanfly Engine Ace - Ace Battle Engine and Main. Save to take effect. This script can't be used with YSA Battle System: Classical ATB. 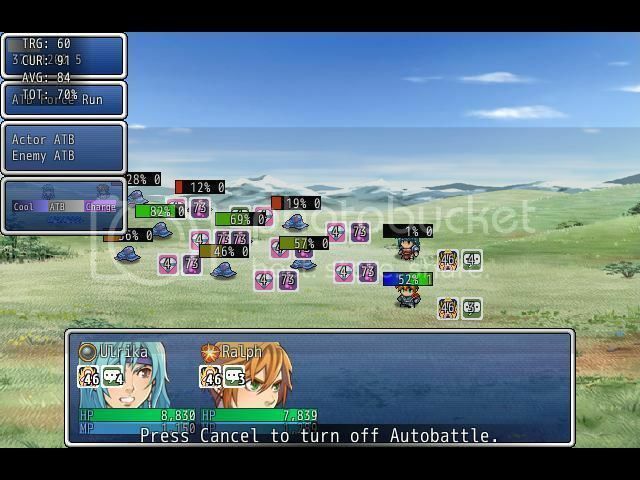 Set DEFAULT_BATTLE_SYSTEM in Yanfly Engine Ace - Ace Battle Engine as :ecatb to set the default battle system as that of this script. 1. Using Yanfly Engine Ace - Ace Core Engine as well is highly recommended as it fixes the force action bug of this script and improve the atb percent and action points display in the actor atb bars. 2. Using Yanfly Engine Ace - Buff & State Manager is highly recommended as it displays the states' remaining turns. 3. Using Yanfly Engine Ace - Skill Cost Manager is highly recommended as it can display the skills/items' action point requirements by adding AC0 in front of ACX used by those skills/items and using <custom cost: skill.ecatb_act_cost[@actor]>. 4. Using Cidiomar's Input as well is highly recommended as it lets users set custom keymaps, which is useful for features using keyboard inputs. 5. Using DoubleX RMVXA Dynamic Data is highly recommemded as it lets you change the notetag values on the fly. - ecatb_note_strings[note] is an accessor letting you store your new notetag values of notetag note. - reset_ecatb_notes(note) applies the above changes. 6. Using DoubleX RMVXA State Counters is highly recommended as it displays the enemy countdown states. 7. Using DoubleX RMVXA State Triggers is highly recommended as the CATB Clear Addon and some features of the CATB Countdown Addon are outsourced to that script. 8. This is an advanced complicated script, meaning testings are likely needed to comprehend the use of every configuration of this script. 9. This script can run using the default settings but you're still highly recommended to comprehend all user settings of this script. 10. This script checks and corrects most configuration(but not notetag) values, but you're still highly recommended to validate every configuration(and notetag) values themselves. 11. Using too many notetags and/or complicated configuration settings and/or notetag values can cause severe performance issues. Sweet! Thanks for sharing, DoubleX! :-) Always can use more battle stuff! Always nice to have another scripter. This looks pretty sweet. Thanks for sharing DoubleX.